Visitors to Yate Leisure Centre in Bristol may be surprised to ﬁnd a new addition at the venue – an 18 x 10m temporary outdoor swimming pool. While the indoor swimming pool is out of action for essential maintenance until October, management at the leisure facility called upon Rio Pools to come up with a temporary option to ensure there is no loss of service to the many swimmers who use the centre. Rio Pools opted for a timber construction method, ﬁnished with a vinyl liner. 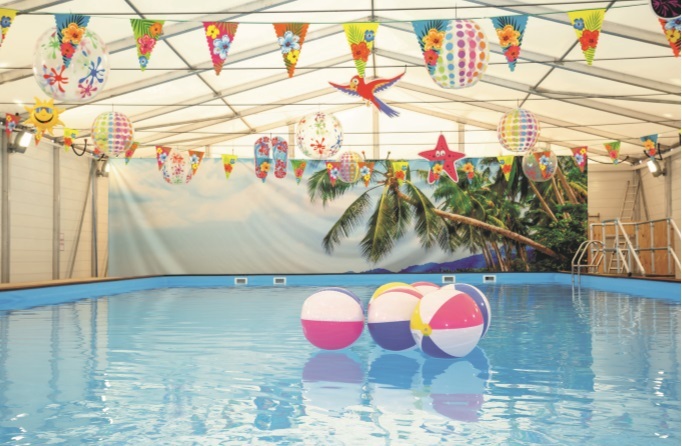 The pool is housed in an insulated marquee complete with a separate pod which houses a temporary ﬁltration, dosing, heating and air handling plant. There’s also a temporary lighting rig, instructor plant-room and safety balustrades. The installation process also involved removing 50 parking spaces from the leisure centres car park, and borrowing a measured quantity of heated/treated water from the indoor pool to ﬁll the replacement. At ﬁrst it may seem an extravagant and ludicrous use of tax payers’ money, but when balanced against what these commercial pools now generate in revenue from round-the-clock clubs, swimming lessons and pool parties, the temporary facility pays dividends. “Whilst we are not privy to all the numbers, it is our understanding that this initiative has saved the centre several £100,000’s in otherwise lost revenue,” adds Shelley.